Your credit score and underlying history are some of the most vital parts of your financial life. Your credit score follows you forever and it will play a huge role in many major financial situations throughout your life. Many people think that a credit score only really matters when it comes to being approved for a loan or credit card, but it goes far beyond that. Occasionally you will hear each of these phrases interchanged, but it is important to understand the difference between the two. Your credit report is actually a detailed history of your credit information. It will contain current credit information, balances, delinquent payments, bankruptcies, personal identifying information and inquiries. Your credit score is a three-digit number that is based on the information in your credit report. After taking into account all aspects of your report a mathematical formula is used to determine what your score should be, the higher the better. The leading credit score in the industry is FICO and range from 300 to 850. We all know that if you have a low credit score that it will be more difficult to find a bank or credit card company to lend you money, but it goes beyond that. 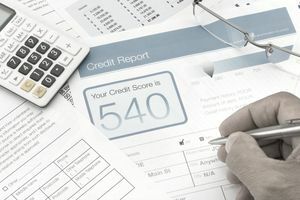 Not only does your score affect whether or not you can borrow money and at an attractive rate, but it can affect everything from insurance rates to employment opportunities. Whether you are insuring your vehicle to purchasing homeowners insurance, your credit score will likely play a role in determining your premium. Insurers typically create what is called an “insurance score” that is largely based on your credit score, but with a few different factors. A poor credit score can cost you hundreds of dollars in additional premiums each year while a good credit score can actually qualify you for a discount. An increasingly common and somewhat controversial practice is taking place as employers check the credit of prospective new employees. The argument for doing this is that employers believe they can use credit history to determine responsibility. Clearly, there are situations where a bad credit history may be due to something completely out of an individual’s control, but this is still something to keep in mind. Have you recently checked your credit score? It is suggested that you do this annually, so if you are behind, be sure to check it out today.